Harnessing our experience in the industry, we take the responsibility to deliver quality to the customers. 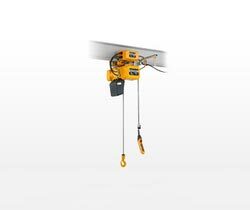 As a Supplier, Exporter and Importer, we offer a range of Electric Hoist (ER2M). This range includes different specification. Our team of expert professionals keeps quality on the top of our priority list. Suitable for lifting applications in construction and mining industry, the entire variety of hoist has the potential to bear bulk equipments and still function perfectly. Such quality is offered at affordable rates. Lay your hands on our hoist for economical rates.